The members of the Paterson police union will take a mandatory vote on Friday while picking up their pays checks to select a candidate for mayor. Alex Cruz, who is the president of the Police Benevolent Association (PBA), Local 1, is likely to receive the endorsement. The endorsement process is not clear. Cruz’s second in command, Vaughan Patterson, did not return a call for comment on Thursday morning, seeking details of the process. “We’re hoping PBA, Local 1 comes out in full support,” said Cruz’s campaign manager Pablo Fonseca. Some of the other candidates in the race view the endorsement process as unfair. Mayoral candidates Pedro Rodriguez, Michael Jackson, Andre Sayegh, and William McKoy said none of them were invited to share their platform with the several hundred members of the police union. The political endorsement breaks with the past mayoral election when the union did not endorse any one candidate. Instead, under Cruz’s leadership, the union contributed to both Sayegh’s and former mayor Jose “Joey” Torres’ campaign in 2014. 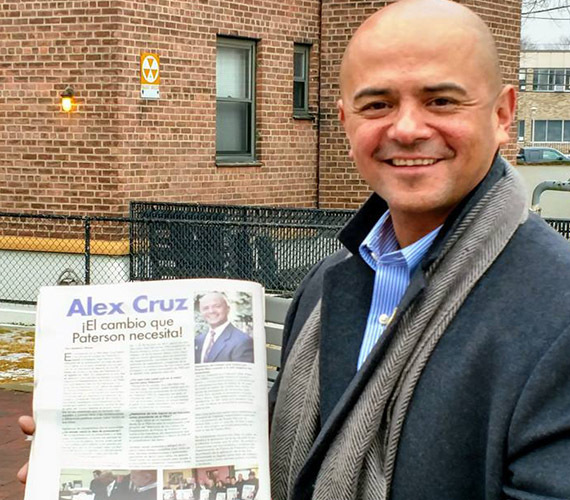 “Paterson needs to go in a new direction,” said Jackson viewing Cruz as part of the status quo. “That endorsement really doesn’t carry a great deal of weight,” said Jackson noting majority of officers live outside of Paterson. “Even though the police officers don’t live in town, they affect the town,” said Rodriguez. He said the morale is likely to take a hit. Cruz has worked in the police department since 1994. He makes $116,200. His candidacy has support from diehard Torres supporters. He changed his voting address from Little Falls to Paterson in July 2017. A candidate has to live in Paterson for a year to qualify for a run. No official decision has been made to disqualify his candidacy. “I don’t know what it is that they are doing,” said McKoy. He said he does not know enough about the endorsement process to comment. Some police officers expressed their dismay at the mandatory endorsement vote. None of them would go on the record to speak openly against or in favor of the process. For some officers, there is genuine fear, that if their candidate loses the race, whomever becomes the mayor, could take aim at the union. The police labor contract expires in 2019. “They’ve already chosen the person they want to support. This whole thing is a ploy,” said Jackson.